This week, Mr. McGee is going to take over the writing for MyMobilehomeMakeover.com. I have posted pics of a starter garden in our front yard a couple of times in a gardening post here. This garden has matured quite well and it was time to give it some more definition. 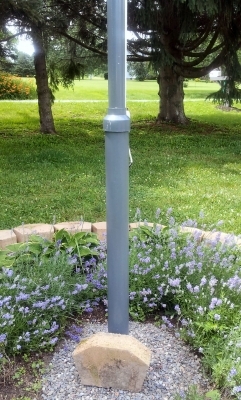 When the Mr. was looking for a place to put up a serious flag pole, I gave him my blessing to make that garden his own. 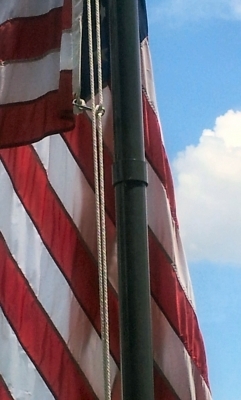 He’s a Marine Corps Veteran so we’ve had many mounted flag poles over the years and always had an American flag hanging, but they wear out and break and have to be replaced too often. 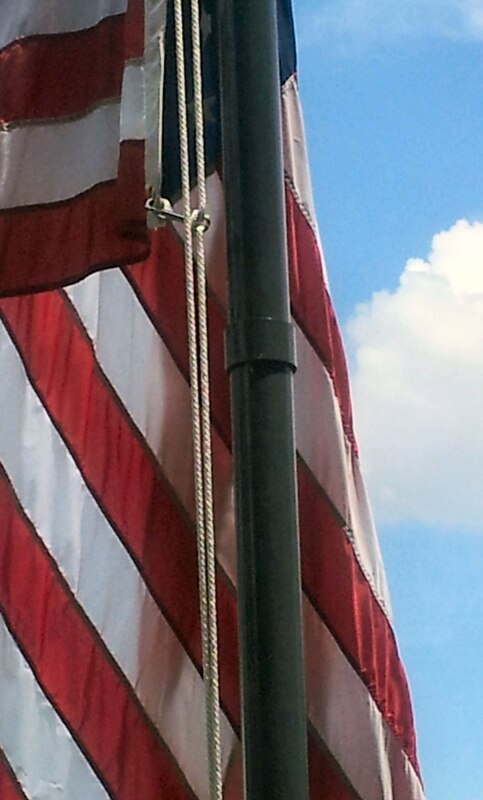 Here’s Mr. McGee’s instructions and some pics of the flag pole he built. Semper Fi! 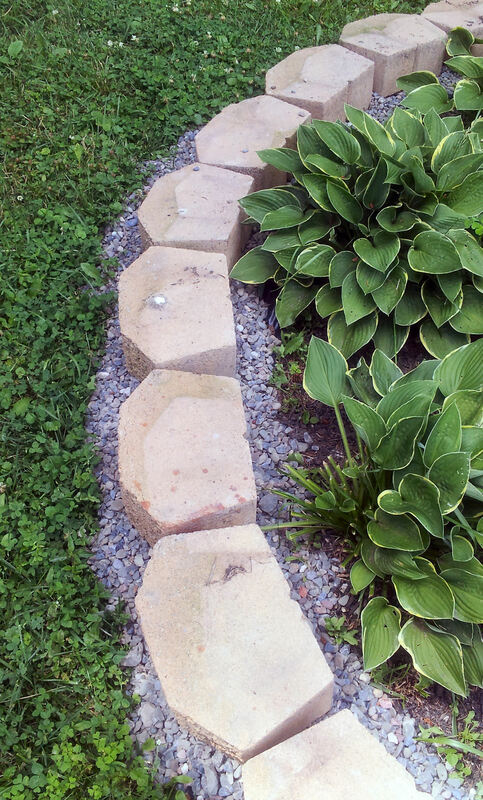 Optional- small stone to cover the concrete and bucket, or you can just cover with dirt. Cut hole in the center of the lid to fit the 3” section of PVC pipe, fill with concrete, place lid on and put the section of pipe in let harden (be sure pipe is straight/level). Dig a hole, place bucket in selected location. Select a 2” PVC pipe and install the pulley 4” from the top and run the rope through the pulley so that the full length of the rope is in half with the fold of the rope on the pulley. Determine how far apart the grommets on the flag are. At the distance below the pulley that you want the flag to sit, connect the rope clips at an interval the same as the distance between grommets on the flag. Once these are attached, glue the PVC end in place. Now glue the 3” to 2” reducer in place, join the 2 sections of 2” PVC sections together using the 2” coupler ensuring all are straight. Attach the grommets on the flag to the clips and raise your flag. Tie the ends of the rope together. Now enjoy! To see the images in full screen, click on the FS in the bottom right hand corner in the gallery. 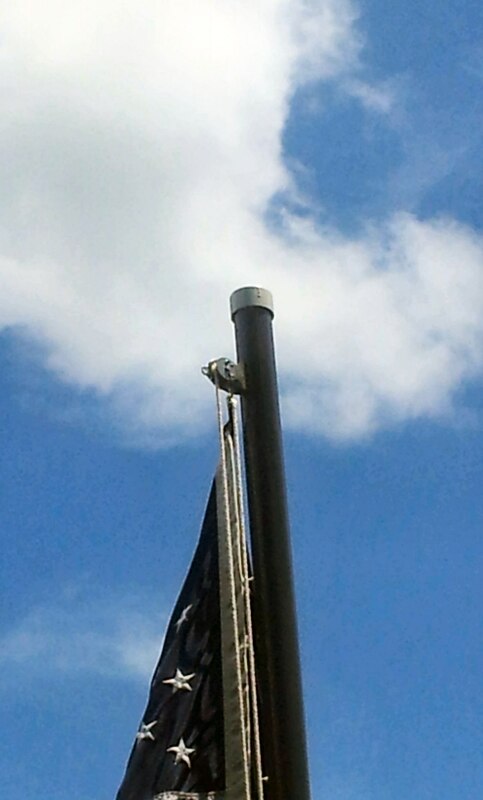 The flag pole is finished! Glue 2 sections of 2” PVC sections together using the 2” coupler ensuring all are straight. Cut hole in the center of the lid to fit the 3” section of PVC pipe, fill with concrete, place lid on and put the section of pipe in and let harden (be sure pipe is straight/level). Dig a hole, place bucket in selected location. 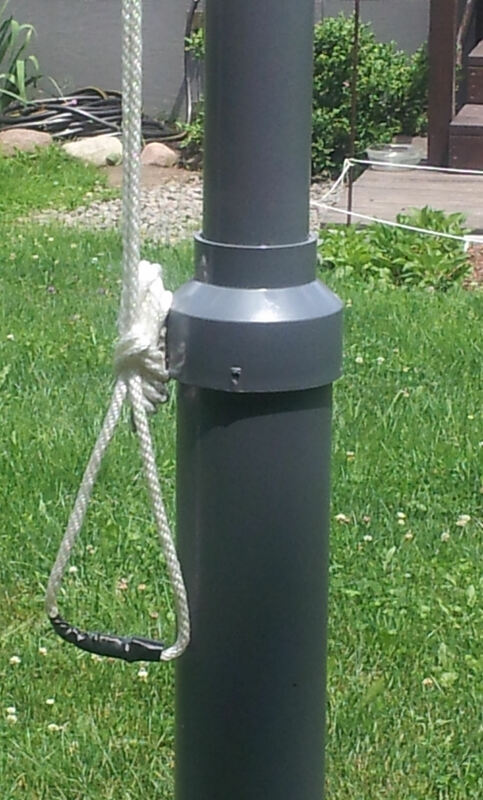 Select a 2” PVC pipe and install the pulley 4” from the top, run the rope through, then glue the PVC end in place. Finally some definition to the edge of this pretty Hosta and Lavender garden. This looks awesome. I’ve been looking for an economical way of putting a large flag pole in our yard. I hope it’s held up nicely under all the elements. Thank you for sharing and thank you for your service. Daughter of a proud Marine. 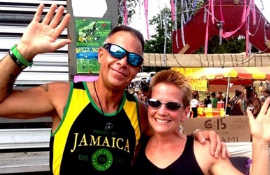 Thanks for visiting our site, Cheryl! We really love this flag pole. It was very easy and has held up to many high wind storms and cold winters. Is there any other kind of Marine than a proud one? :-) We appreciate your Dad's service. Semper Fi. I’ve been looking for an economical and attractive way to add a large flagpole to our yard. This looks awesome. I hope it’s held up against the elements nicely for you. Thanks for sharing and thank you for your service. Proud Daughter of a very proud Marine. The American flag should always be flown in a manner consistent with its purpose as a national symbol. Thanks for the great tutorial. I thought he looked like a Marine! Thank you for your service and for your blog! 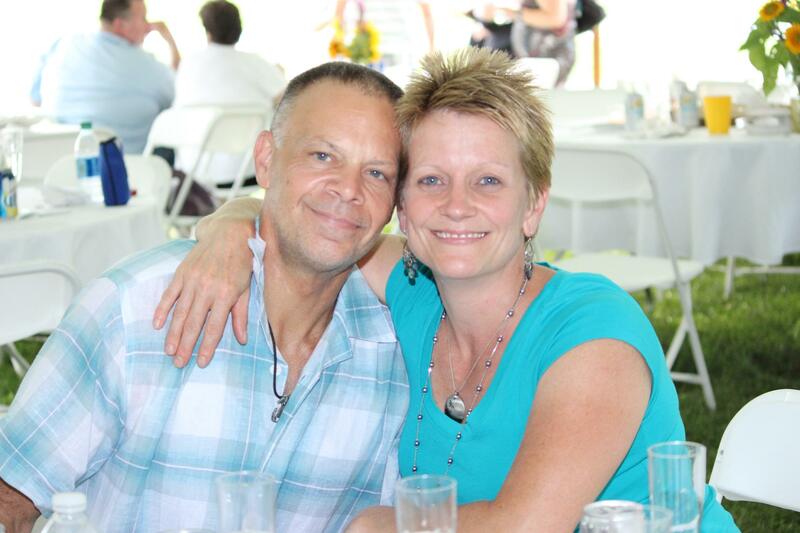 My husband just retired after 20 years of service in the Marines, he was a helicopter mechanic in Operation Iraqi Freedom and a refrigeration mechanic in the Gulf War. Anyhow, we bought land with an old farmhouse on it for us and our 3 children but the farmhouse can't be saved so we are looking into buying a used double wide. I appreciate all of the ideas you and other bloggers document as it really helps. I may not always comment but I do read. Keep up the great blog and Semper Fi! Thanks so much for commenting, Christina. Mr McGee is proud of his service. Thank you to your husband for his service as well. It takes a certain kind of person to be a Marine, that's for sure. I'm sorry to hear about the farmhouse difficulties. Does it have to be torn down? I certainly hope the cost reflected the problems associated with it and that you didn't lose a lot of money on this deal. A used doublewide is a great idea. I would love to hear your experience of moving one onto your property. It would be great to get an idea of how a used home comes apart and goes back together and the trials and successes with that sort of project. If you get a chance, please do come back and share. Thanks again for your comment and good luck with your home search. Great post! Thanks for sharing this to us and keep posting! This adds more information about flagpoles. We have a flag pole in our front yard, too. It's been up about 16 years and at the time we put the landscape timbers around the bottom, a small box style, and it needs pulling up and thrown away. I like the way you used the concrete surrounds to make a larger plant bed area – this will be a fall project for me, when the heat and humidity fall drastically. I think it all looks great! Thanks for your comment, JoAnn. And also for visiting MyMobilehomeMakeover.com ! 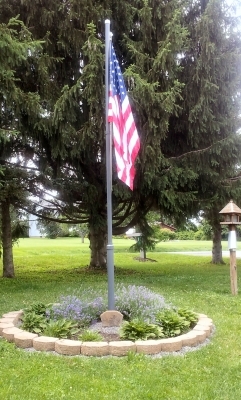 I love the way this flag pole and garden looks in our front yard. Yesterday, the wind was just right and the sun was shining and the flag was just floating nice and high. It's a great addition to your spaces! If I were to change anything, I would add one more section for a little more height. But it's fine the way it is. I was also remarking to Mr. McGee this morning that I really like that I don't hear the pulley clanging on a metal pole all the time since it's made from PVC. So nice! Good luck on your flag pole project and come back soon! First, thank you Mr. McGee for your service. Second, how cool is that! 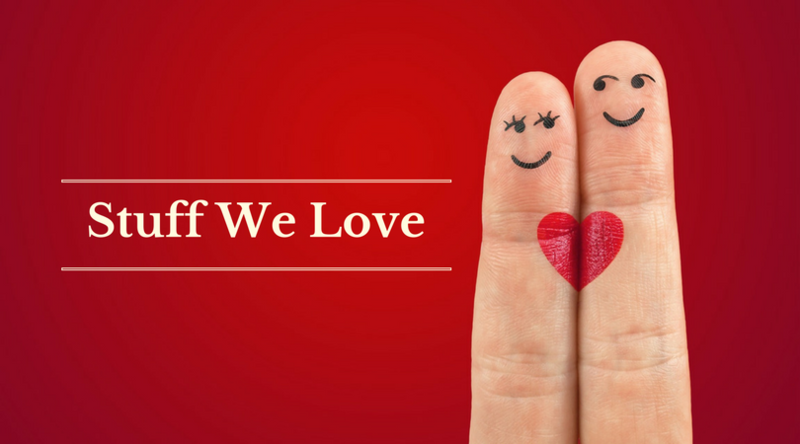 Love your blog…. Thanks for visiting, Theresa, and also for your comment. We love the flag pole! We've been to your site as well. Great stuff! Thanks for sharing with us! My Book and Free Product Guide! Visit MyMobileHome Makeover.com's profile on Pinterest. Order online and pick up in-store! mmhmakeover on Don’t Waste Space- Make a Closet! mmhmakeover on Mobile Home Bathroom-Redux! mmhmakeover on Can I Paint My Mobile Home? Yes I Can! Hi! We're The McGees. We love dreaming up new ideas for our double wide home and doing the work ourselves as much as we can. Visit us often to see what we're up to! And if you leave a comment, we'll be sure to respond. Thanks for visiting! Sign Up Now to Get Updates! Now you don't have to miss a thing. Sign up now and we'll drop you an email whenever a new post is ready to view! Click to follow and see what we're doing around the Web! Please know that all ideas posted here are from our own experience and desires with regard to our mobile home and the homes of other contributors. These ideas are in no way meant as recommendations or expert advice. All projects and ideas that you take and try are done so at your own risk. See the latest project and like us on Instagram! We used U-Pack with great success! Don’t Waste Space- Make a Closet! Check Out My Appearance on Our Local Radio Show! Is Your Mobile Home Clean? Get Your House Clean Now! Check Us Out on Today.com! !